The Charter for Change held its 3rd annual meeting 4-5 December 2018 in Oslo, Norway. Close to 50 representatives, INGO signatories and local NGO endorsers from around the world, came together to take stock of progress and address enduring blockages to locally-led humanitarian response. The theme of the meeting was “2018: The Charter for Change at Crossroads” in recognition of the Charter’s journey from 2015 until today. As a catalyst to the localization movement, the Charter continues to play a critical role but needs to adapt to remain cutting edge. The 2018 meeting was marked by rich, frank exchanges. It reaffirmed the continued relevance of the Charter and breathed new energy into our collective action, leading to heightened team cohesion and purpose. Together, we discussed blockages and solutions and identified critical action for 2019, including revisions to the Charter, collective priorities for practice and advocacy, improved tracking and reporting, and strengthened engagement between signatories and endorsers. We took the pulse of localization globally, recognizing that progress has yet to trickle down to a critical mass of local actors: o On the donors’ and UN side, there has been some progress toward more direct engagement with, and funding to local actors, increased reporting on funding flows to local actors, innovative capacity strengthening, piloting of locally-led approaches, access to humanitarian coordination forums for local actors, and efforts to include localization in humanitarian instruments – but progress overall has not been fast, wide or consistent o Global trends are pointing towards regionalization and decentralization o On the flip side, more assertive and capable Southern governments and local actors force localization forward but there is a worrying trend towards restrictive civil society space. We situated C4C within existing trends: recognizing its role as a catalyst for localization globally but in need of adjustments 3 years since its launch. C4C has established itself as one of the foremost vehicles for moving forward on localisation, but within a wider context of considerable rhetorical support for localisation but insufficient real change. This is particularly noticeable on the issue of increased funding, but progress has also been slow on leadership, coordination and capacity enhancement. challenging). For the first time, we assessed our compliance not just globally but also in the context of an ongoing response (the Rohingya crisis) which proved useful and will be replicated. We recognized that we are still significantly challenged by ethical recruitment, the area where least progress was reported. Local NGO endorsers felt signatory organisations have not progressed as well as they might think. 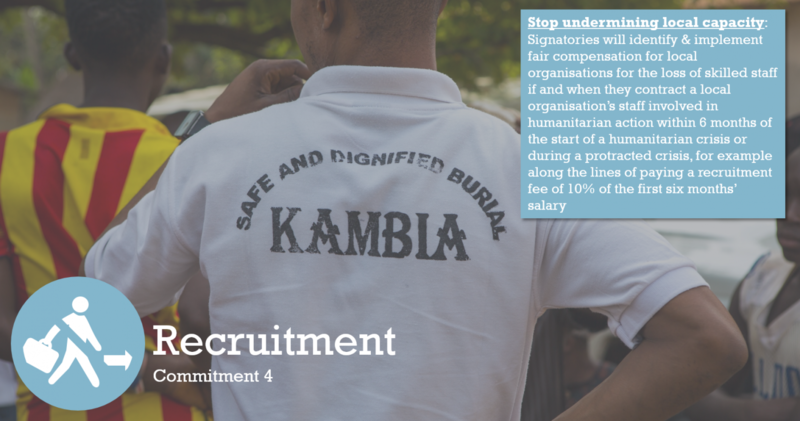 For them, subcontracting and local actors’ visibility remain significant issues. “We are calling for 3 Cs: more and better Capacity strengthening, stronger Communication about C4C at country level, and greater Coherence between INGO head office and country office policy and practice” (Indian endorser). Signatories agreed that “we need the endorsers to keep us sharp” and that we should go beyond our own self-assessments. We agreed that the endorsers’ survey conducted for the first time in 2018 will become a defining feature of future annual reports. Thirteen local NGO endorsers took center stage to report how Localization plays out in their own country context. “C4C is not so much at cross-roads, it is taking roots, getting momentum in Bangladesh, especially in the Rohingya response. Although we have a long way to go, we all need to change, including our local organizations” (Bangladeshi endorser). We were reminded that localization is first and foremost about affected people “their agency, centrality, dignity, needs, rights, and role in crisis response,” and to “not let reflections on INGO/NNGO dynamics distract us from empowering and respecting the people we serve” (East Jerusalem endorser). In the Philippines, where localization has progressed significantly, endorsers identified enabling conditions as “participatory, people-led governance, a vibrant civil society, strong local networks and alliances, collective advocacy, committed C4C signatories, and locally-led response delivering real gains on the ground.” Local actors are increasingly asserting their role and influence in various fora or sectors: in the DRC, Sexual and Gender-Based Violence (SGBV) is an effective entry point for local women’s rights organizations “where we participate and make our voice heard in SGBV coordination and decision-making spaces from Goma, to Kinshasa and Geneva” (DRC endorser). South Sudan endorsers spoke about the critical role of the NGO Forum “in representing the interests and facilitating the collective voice of local NGOs”. Nigerian endorsers spoke about mentorship schemes that help local actors meet due diligence requirements and access pooled funding. Leading localization activists noted that “positive engagement and dialogue” and “moving beyond the excessive focus on relief to include peace and development” are critical. “We should avoid the blame game, be proactive, not reactive, look beyond Northern processes to find our own solutions (with innovations in governance, resource mobilization and approaches such as Survivor-Led Response).” “We can no longer be spoon-fed.” (India, Bangladeshi and Turkish endorsers). We considered specific areas where we continue to struggle. We were concerned that in some quarters Protection from Sexual Exploitation and Abuse (PSEA) was being used as an argument against localization, because it was difficult for donors to track and enforce NNGO/LNGO compliance with safeguarding expectations, and because some reports asserted that a significant share of safeguarding incidents involved NNGO/LNGO personnel. Endorsers felt that these reports were inaccurate and unfair. There is a case for more research and evidence-gathering to increase donor confidence in NNGO/LNGO safeguarding policy and practice. underlined the importance of being able to directly speak to donors, explain some of the challenges and suggest solutions. The de-facto limited access that most national NGOs have to the OCHA-managed country-based pooled fund in Nigeria was underscored, as well as the need for progressive donors like Norway to influence their peers in policy forums such as Good Humanitarian Donorship (GHD) to move forward to deliver concrete progress on localisation. National actors also emphasized the fact that even donors with in-country staff often do not see and understand the key role many local and national organisations play in the delivery of humanitarian aid. We identified key action for 2019. We agreed a process to assess the suitability of new applicants to Charter for Change. We discussed some light-touch edits to the wording of the Charter which will be taken forward in the first quarter of 2019. We agreed it is a mandatory requirement of continued membership to submit a robust written selfassessment of progress against the 8 commitments annually. We recognised the importance of increasing awareness of C4C amongst signatory and endorser staff not directly involved and agreed to highlight best practices in this and other areas in the 2019 C4C report. We also agreed to develop an advocacy plan for the year and to explore the possibility of the C4C secretariat being hosted in an endorser organisation.